Kale Christmas wreath salad is a healthy recipe that is perfect for parties during the holiday season. This low calorie, low carb salad is massaged with a tasty lemon garlic dressing. Decorate with a cute red pepper bow that’s easy and quick to assemble. Impress your guests with this yummy make ahead salad. Are you trying to eat healthier? 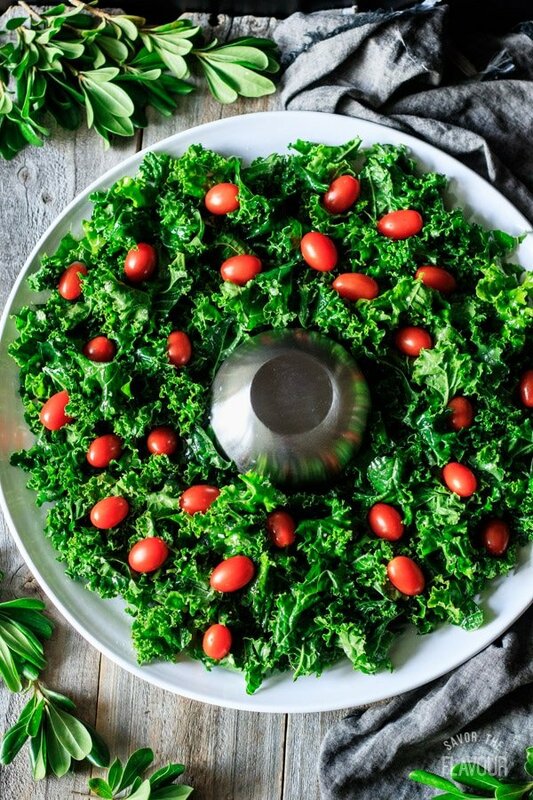 Try this kale Christmas wreath salad. 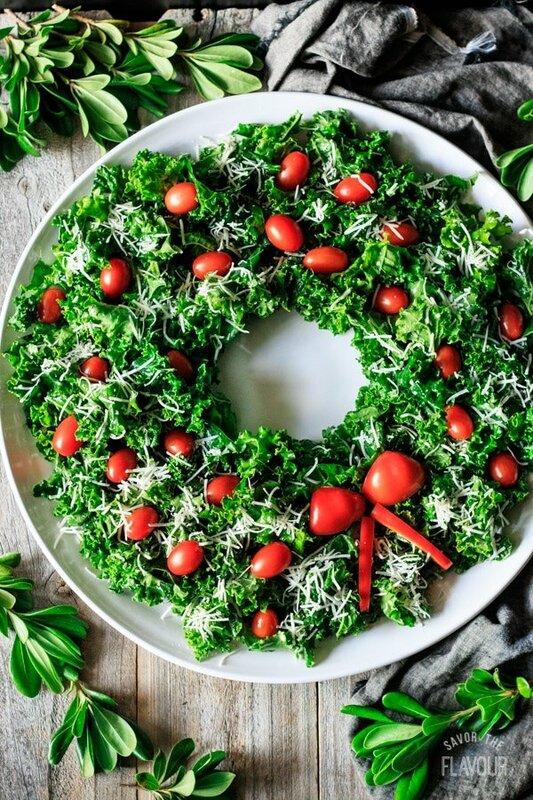 It’s low calorie and low carb, plus it’s high in vitamin K and C. Impress your dinner guests by shaping the salad into a festive Christmas wreath; it’s really simple to do! Keep reading to find out how it’s done. 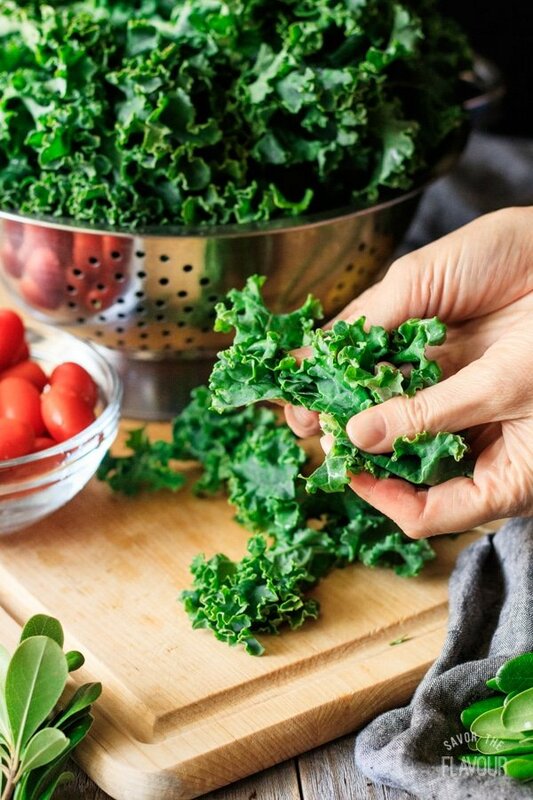 What is the difference between curly kale and Tuscan kale? Curly kale is more hearty, ridged, and frilly. Tuscan kale is more tender and great for raw dishes. Curly kale is easier to find in grocery stores. 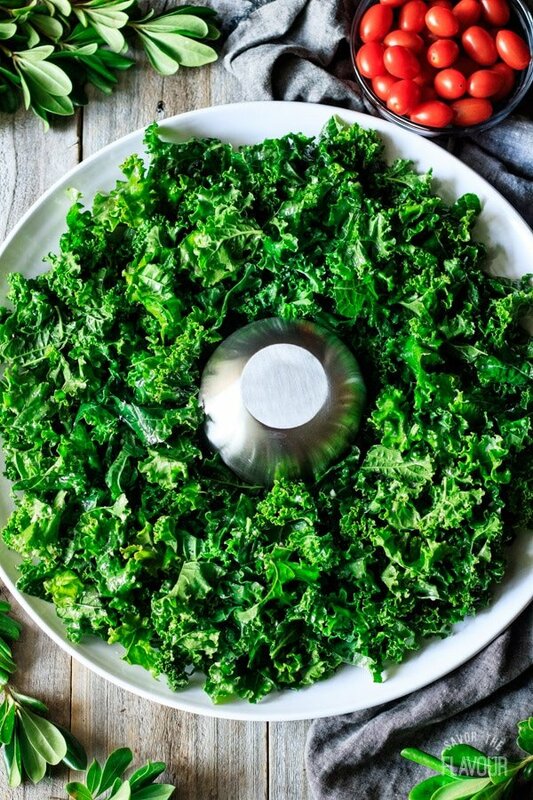 How do you soften kale for a raw kale salad? A heavy sprinkle of salt. Massage kale with both hands. Massaging kale tenderizes it, making it silky and sweet instead of bitter and tough. 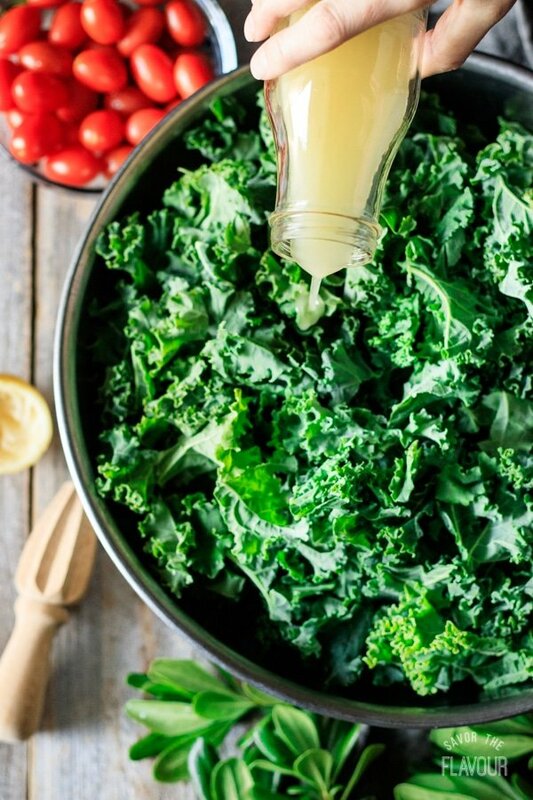 Rub the kale with olive oil and salt for 5 minutes. You will see it darken in color and shrink in size. Taste. If it’s still bitter, continue rubbing the kale leaves. 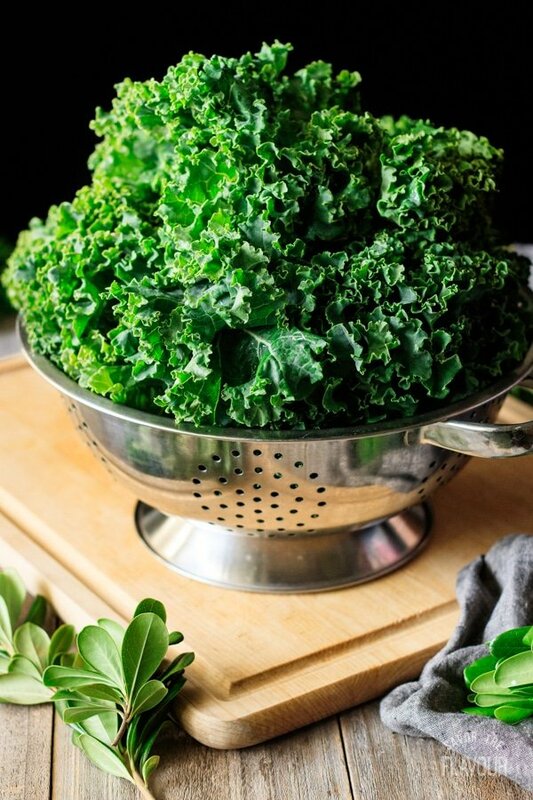 Rinse each kale leaf under cold running water, then place in a colander to drain. Pat each leaf dry with an absorbent kitchen towel. Slide your fingers down the stem to remove the leaves. 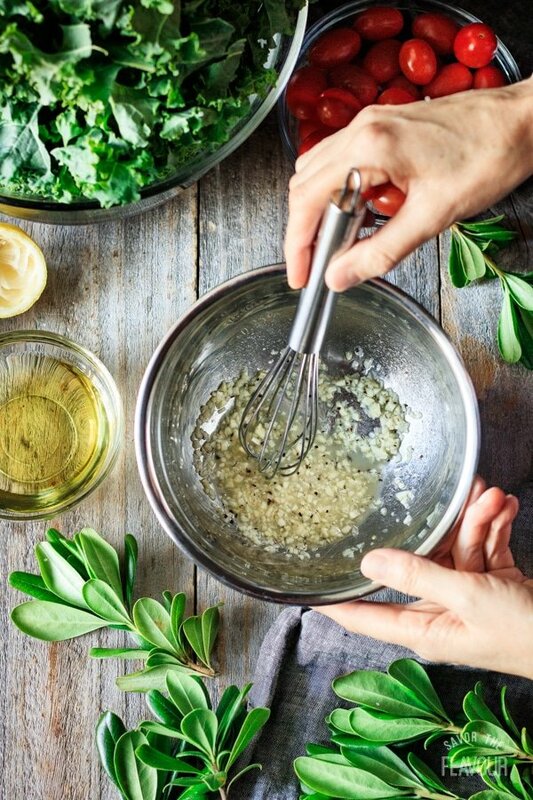 To make the lemon garlic dressing, mince up 6 to 7 jumbo-sized garlic cloves and juice two large lemons. 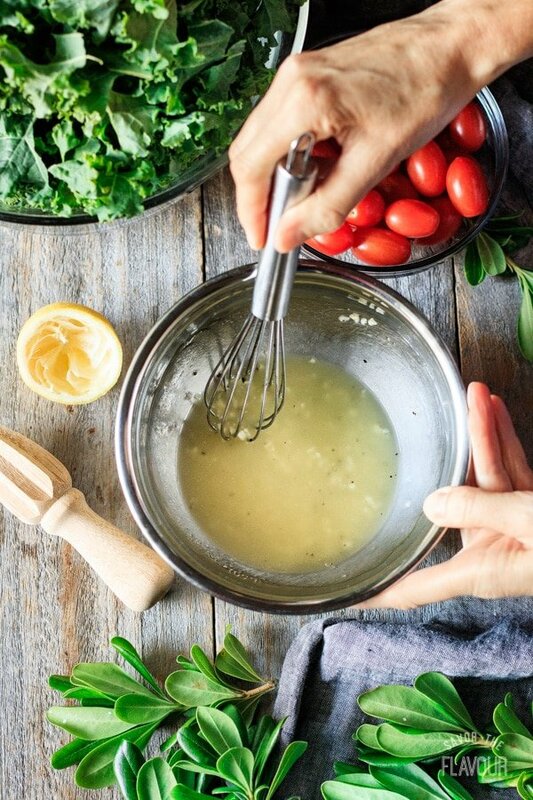 Whisk the lemon juice, garlic, salt, and black pepper together in a small mixing bowl. Add the olive oil and continue whisking until it thickens. Put the kale in a very large mixing bowl. Pour the lemon garlic dressing over top. Toss the salad with your hands until the dressing is well incorporated. 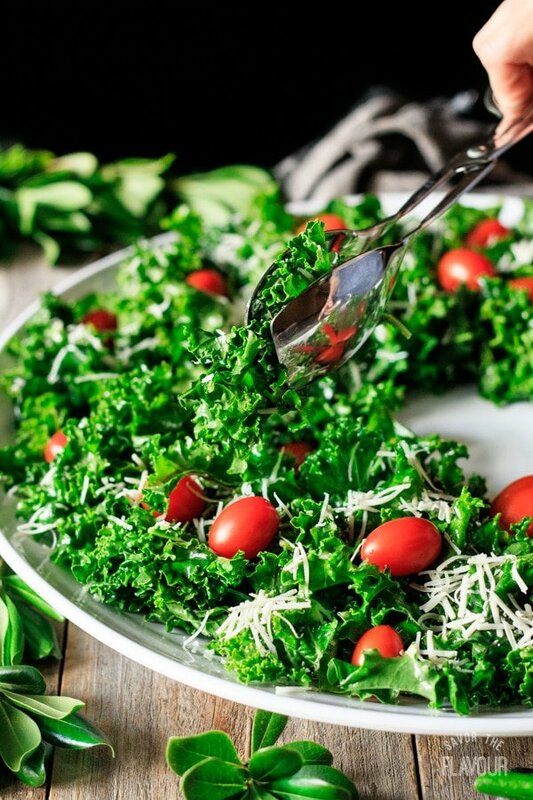 Massage the kale for 5 minutes by rubbing the dressing into each piece, then taste. If it’s bitter, continue massaging. Let the kale sit for a minimum of 10 minutes. 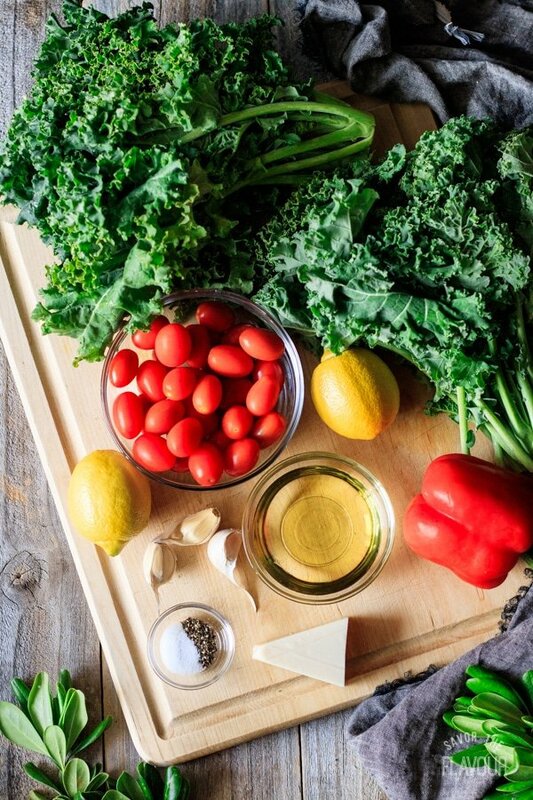 While the kale is resting, grate the cheese and find the serving platter and a small bowl. Place the bowl in the center of the large platter. 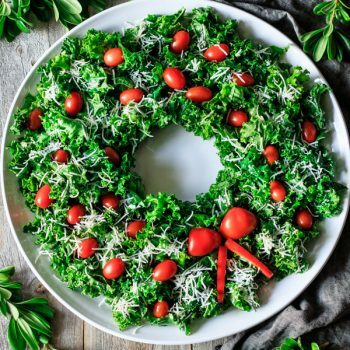 Carefully arrange the kale around the bowl to make a wreath shape. 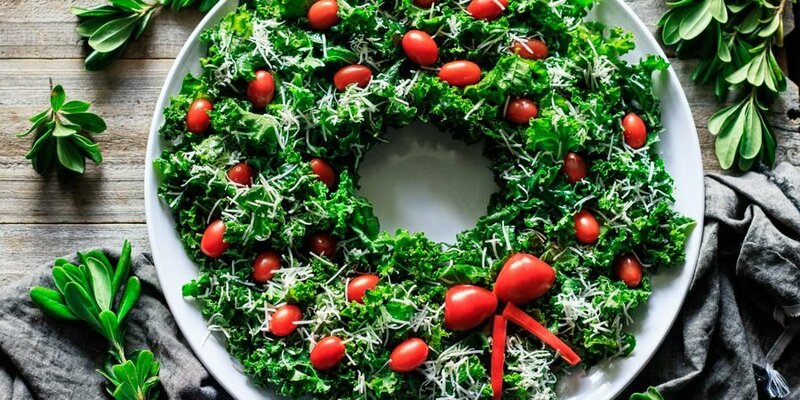 Place grape tomatoes all over the wreath, except the bottom. This is where the bow will go. Make the bow by cutting the bottom off the red bell pepper. Make sure the bell pepper has a four pointed bottom. Cut each point apart. (These points will make the bow.) Cut the seeds and membrane out of the bell pepper, then slice two long strips of pepper with a curve at one end for the bow tie ends. Arrange the four pepper pieces like the picture below to form the Christmas bow and sprinkle with finely grated Asiago cheese. The salad can be made up to one day ahead; just assemble the wreath before you want to serve it. This salad tastes great cold or at room temperature. Want to add nuts? Try toasted pine nuts, walnuts, or toasted silvered almonds. Want cheese substitutions? Try Parmesan, Pecorino Romano, or Asiago. Want to add more protein? Try cannellini beans, salami, prosciutto, or make smoked ham rosettes. Want to add croutons? Try whole wheat or rye bread. Want more veggies? Try sun-dried tomatoes or avocado. Want to change up the dressing? Add lemon zest or grated cheese. Want to spice it up? Add red pepper flakes. Not interested in shaping this into a Christmas wreath? No problem! This salad is easy to convert to a traditional tossed salad that you can enjoy year round. Instead of using the red pepper for a festive bow, chop up half of the pepper and add it to the salad. Don’t want to eat the grape tomatoes whole? Cut them in half or in quarters. 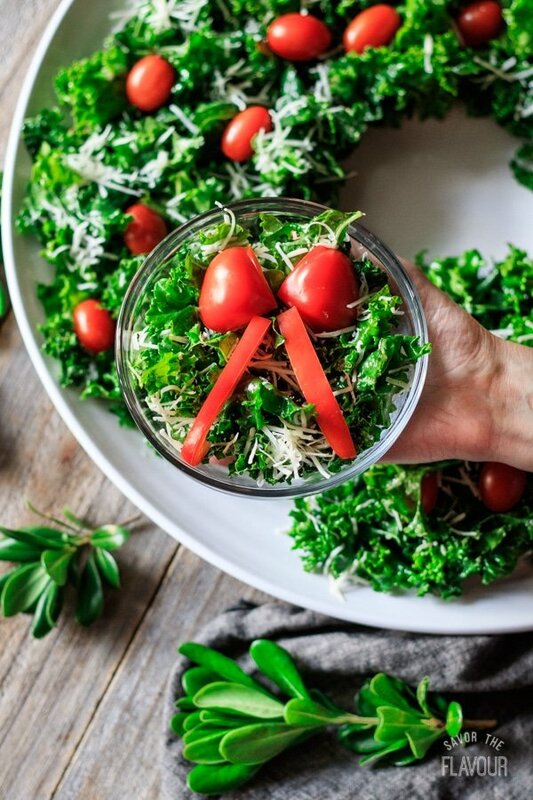 Feel free to customize your kale salad by making it more hearty (adding salami or croutons) or making it spicier (sprinkling on some red pepper flakes). If you want to make it more like a kale Caesar salad add some minced up anchovies to your dressing and change the cheese to Parmesan. Eat healthy this winter with these other salads. Brussels Sprouts Salad with Maple Balsamic Dressing: this crunchy salad is filled with bacon, pomegranate, cheese, and walnuts. Roasted Grape Tomatoes: enjoy these flavorful tomatoes with roasted garlic, Parmesan cheese, and spices. Low Carb Bell Pepper Salad: a low-calorie, low-fat, and low-carb salad packed with color and crunch! Did you make this Christmas salad wreath? Please leave a star rating below the recipe to share how you enjoyed it. Rinse the kale and pat it dry one piece at a time. Remove the ribs by pinching the end of the stem and running your fingers down it. Tear each piece into bite-sized pieces and place in a large mixing bowl. Whisk together the lemon juice, minced garlic, salt, and pepper. Add the olive oil and whisk again to make a thick dressing. Pour the lemon garlic dressing over the kale. Start tossing the salad with both hands to coat each piece, then rub the kale leaves with both hands for 5 minutes. Massaging the kale will take away the bitterness and toughness. Taste a piece of kale. Adjust seasonings, if necessary, by adding more salt, black pepper, garlic, or lemon juice. Let the massaged kale sit for 10 minutes or overnight. This will help remove more of the bitterness. Put a bowl in the center of a large circular tray. 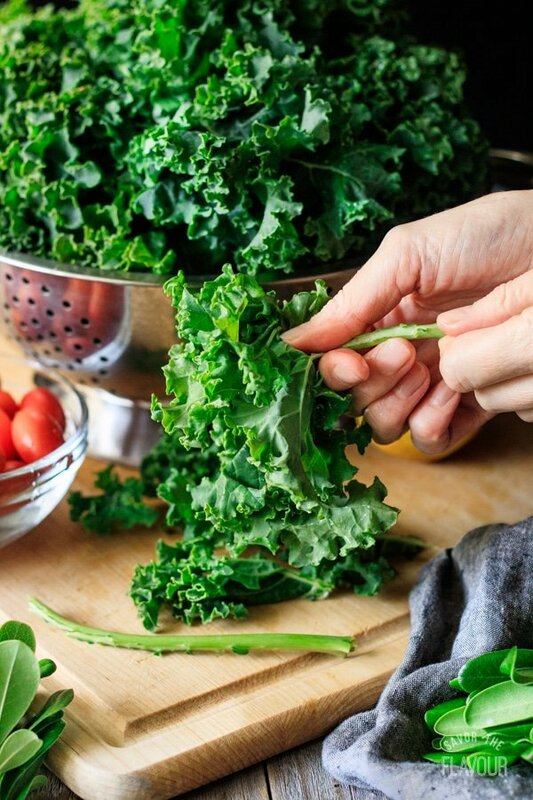 Arrange the massaged kale around the edge, making a wreath shape. 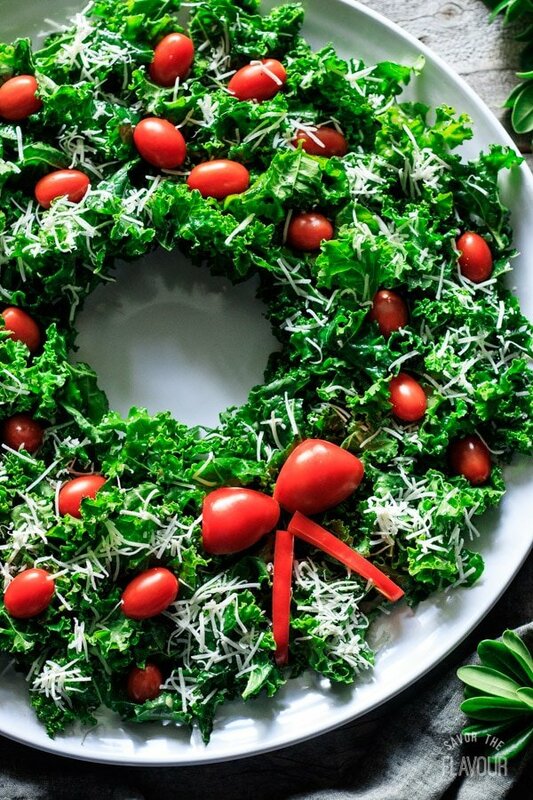 Add grape tomatoes all over the wreath salad, but leave the bottom empty for the red pepper bow. To make the red pepper bow, cut the bottom off of a large red bell pepper. Cut apart the four points so you can make a bow. (Refer to the picture in the blog post.) Remove the seeds from the bell pepper and cut two long strips for the ends of the bow. Make sure to have a curved end on each pepper strip. Just before serving, sprinkle the finely grated Asaigo cheese over the wreath, being careful not to cover the red pepper bow or the grape tomatoes. Serve the salad cold or at room temperature. 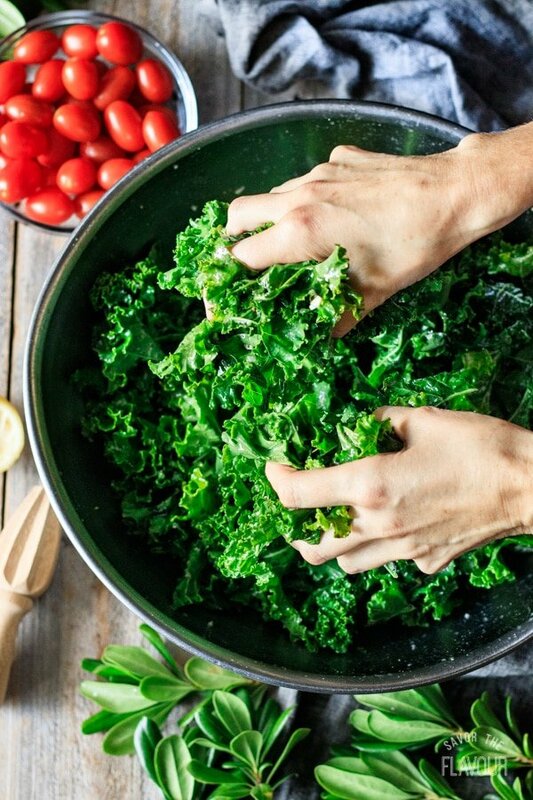 Place the massaged kale in a very large bowl. 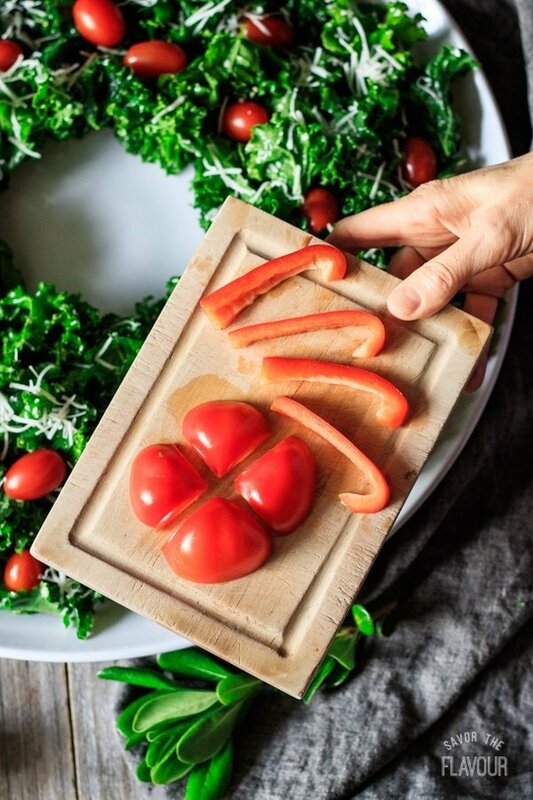 Chop half of a red bell pepper and the grape tomatoes cut in half, then add them to the salad along with 1/2 cup of coarsely grated Asiago cheese. Toss with both hands until the ingredients are well distributed. Garnish with Asiago shards and grape tomato halves and serve. This salad will keep in the fridge for three days in an airtight container with the dressing on it. It actually tastes better if made in advance, as the kale will become less bitter and tough. For maximum freshness, add the tomatoes and cheese just before serving.